Afghanistan (+93) Albania (+355) Algeria (+213) American Samoa (+1684) Andorra (+376) Angola (+244) Anguilla (+1264) Antarctica (+672) Antigua and Barbuda (+1268) Argentina (+54) Armenia (+374) Aruba (+297) Australia (+61) Austria (+43) Azerbaijan (+994) Bahamas (+1242) Bahrain (+973) Bangladesh (+880) Barbados (+1246) Belarus (+375) Belgium (+32) Belize (+501) Benin (+229) Bermuda (+1441) Bhutan (+975) Bolivia (+591) Bosnia and Herzegovina (+387) Botswana (+267) Brazil (+55) British Indian Ocean Territory (+246) Brunei Darussalam (+673) Bulgaria (+359) Burkina Faso (+226) Burundi (+257) Cambodia (+855) Cameroon (+237) Canada (+1) Cape Verde (+238) Cayman Islands (+1345) Central African Republic (+236) Chad (+235) Chile (+56) China (+86) Christmas Island (+61) Cocos (Keeling) Islands (+672) Colombia (+57) Comoros (+269) Congo (+242) Congo, the Democratic Republic of the (+242) Cook Islands (+682) Costa Rica (+506) Cote D'Ivoire (+225) Croatia (+385) Cuba (+53) Cyprus (+357) Czech Republic (+420) Denmark (+45) Djibouti (+253) Dominica (+1767) Dominican Republic (+1809) Ecuador (+593) Egypt (+20) El Salvador (+503) Equatorial Guinea (+240) Eritrea (+291) Estonia (+372) Ethiopia (+251) Falkland Islands (Malvinas) (+500) Faroe Islands (+298) Fiji (+679) Finland (+358) France (+33) French Guiana (+594) French Polynesia (+689) Gabon (+241) Gambia (+220) Georgia (+995) Germany (+49) Ghana (+233) Gibraltar (+350) Greece (+30) Greenland (+299) Grenada (+1473) Guadeloupe (+590) Guam (+1671) Guatemala (+502) Guinea (+224) Guinea-Bissau (+245) Guyana (+592) Haiti (+509) Holy See (Vatican City State) (+39) Honduras (+504) Hong Kong (+852) Hungary (+36) Iceland (+354) India (+91) Indonesia (+62) Iran, Islamic Republic of (+98) Iraq (+964) Ireland (+353) Israel (+972) Italy (+39) Jamaica (+1876) Japan (+81) Jordan (+962) Kazakhstan (+7) Kenya (+254) Kiribati (+686) Korea, Democratic People's Republic of (+850) Korea, Republic of (+82) Kuwait (+965) Kyrgyzstan (+996) Lao People's Democratic Republic (+856) Latvia (+371) Lebanon (+961) Lesotho (+266) Liberia (+231) Libyan Arab Jamahiriya (+218) Liechtenstein (+423) Lithuania (+370) Luxembourg (+352) Macao (+853) Macedonia, the Former Yugoslav Republic of (+389) Madagascar (+261) Malawi (+265) Malaysia (+60) Maldives (+960) Mali (+223) Malta (+356) Marshall Islands (+692) Martinique (+596) Mauritania (+222) Mauritius (+230) Mayotte (+269) Mexico (+52) Micronesia, Federated States of (+691) Moldova, Republic of (+373) Monaco (+377) Mongolia (+976) Montserrat (+1664) Morocco (+212) Mozambique (+258) Myanmar (+95) Namibia (+264) Nauru (+674) Nepal (+977) Netherlands (+31) Netherlands Antilles (+599) New Caledonia (+687) New Zealand (+64) Nicaragua (+505) Niger (+227) Nigeria (+234) Niue (+683) Norfolk Island (+672) Northern Mariana Islands (+1670) Norway (+47) Oman (+968) Pakistan (+92) Palau (+680) Palestinian Territory, Occupied (+970) Panama (+507) Papua New Guinea (+675) Paraguay (+595) Peru (+51) Philippines (+63) Poland (+48) Portugal (+351) Puerto Rico (+1787) Qatar (+974) Reunion (+262) Romania (+40) Russian Federation (+70) Rwanda (+250) Saint Helena (+290) Saint Kitts and Nevis (+1869) Saint Lucia (+1758) Saint Pierre and Miquelon (+508) Saint Vincent and the Grenadines (+1784) Samoa (+684) San Marino (+378) Sao Tome and Principe (+239) Saudi Arabia (+966) Senegal (+221) Serbia and Montenegro (+381) Seychelles (+248) Sierra Leone (+232) Singapore (+65) Slovakia (+421) Slovenia (+386) Solomon Islands (+677) Somalia (+252) South Africa (+27) Spain (+34) Sri Lanka (+94) Sudan (+249) Suriname (+597) Svalbard and Jan Mayen (+47) Swaziland (+268) Sweden (+46) Switzerland (+41) Syrian Arab Republic (+963) Taiwan, Province of China (+886) Tajikistan (+992) Tanzania, United Republic of (+255) Thailand (+66) Timor-Leste (+670) Togo (+228) Tokelau (+690) Tonga (+676) Trinidad and Tobago (+1868) Tunisia (+216) Turkey (+90) Turkmenistan (+7370) Turks and Caicos Islands (+1649) Tuvalu (+688) Uganda (+256) Ukraine (+380) United Arab Emirates (+971) United Kingdom (+44) United States (+1) United States Minor Outlying Islands (+1) Uruguay (+598) Uzbekistan (+998) Vanuatu (+678) Venezuela (+58) Viet Nam (+84) Virgin Islands, British (+1284) Virgin Islands, U.s. (+1340) Wallis and Futuna (+681) Western Sahara (+212) Yemen (+967) Zambia (+260) Zimbabwe (+263) I agree to receive email and sms for future communication. brand, competitors and rising trends. Implement agile social media processes and build better relationships with customers through our response management system. Set up a strategy to maintain online positivity around your brand and management of crisis. Manage and monetize your social media presence through actionable insights. 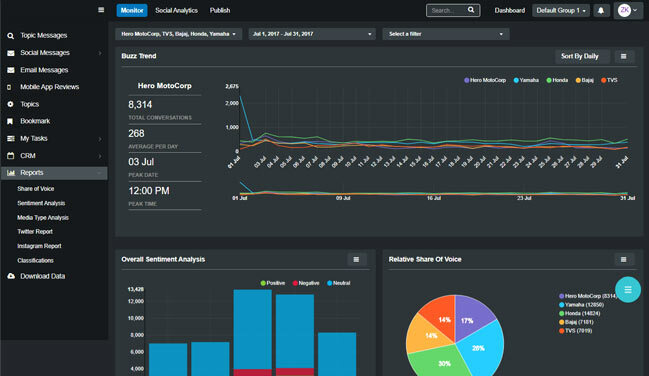 Best-in- class social media intelligence for your brand’s online reputation management. 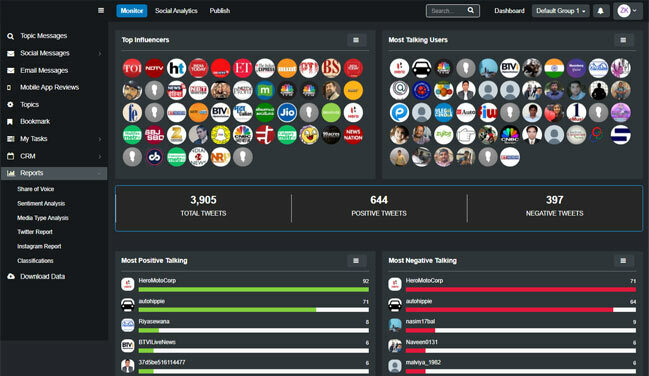 Don't miss out on a single conversation with the best social media monitoring and social listening tools. 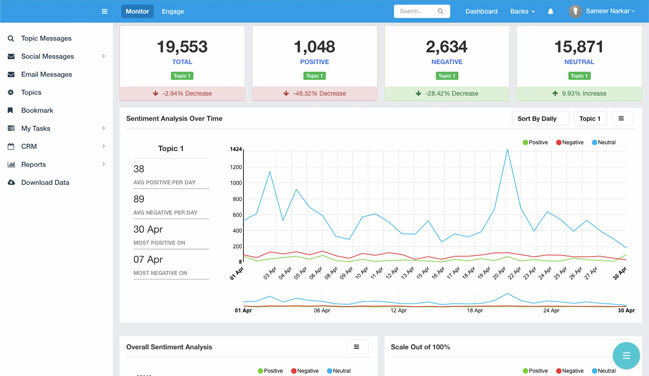 Generate social media analytics reports on-the-go with our easy to use dashboards. Social Listening backed by big data technology for your social media management requirement. Extremely simple and easy-to-use social media management tools for all your brands. Manage your clients with our fully automated online reputation management services. Copyright © All Rights Reserved - BCWebWise Pvt Ltd.